Clicked a link? Wrong message? Wait until the page has finished loading, click in the address bar and then press the Enter key. This is a timing bug in some browsers. There always seems to be too much choice these days and something that has to be sacrificed to get something else. I have done flyovers but that may have been with an old version of Memory Map (there's another option) as I can't see any mention in Quo. I have just had to reinstall all my apps as Win10 cocked up an upgrade. I don't recollect any problems in re-installing Quo. Yes it is a bit clunky but it's cheap and does the job I want it to do. I don't see any problem with map drawing in Quo. Zooming in and out with the mouse wheel the maps change instantly between the scales. I have no idea what can be causing your slow screen updates. I'm running on a 10 year old computer so definitely not fast by modern standards. 22 years ago. Remote but with some excellent paths. Please do not send requests for help direct to me via email or PM. Post your questions on the forum where everyone can see them and add helpful replies. Thanks Fraser. Quo now working ok with a couple of local tiles. For some reason the 3D viewer is faster than the map viewer. A couple more from 1969. I'm not too sure what to make of that. The commercial print chopped off a chunk of signal box, but apart from that there is not much to choose between them. That interesting bit around Hereford where at one time you could see clusters of buildings which never appeared on OS maps! They couldn't have somehow swiped your pic, could they? Looks identical. My memories of dodgy level crossings around there are of the Tram Inn one, to the south. Nigel Brown wrote: That interesting bit around Hereford where at one time you could see clusters of buildings which never appeared on OS maps! Sorry, I meant that it was a postcard-sized print from my negative. The printing was commercial, not a commercial postcard. I have edited it now. This illustrates why I spend so much time thinking about every single word when writing the Templot docs, and still I find folks can get the wrong end of the stick. The printing machines did a lot of the work for you in terms of print exposure, contrast etc and many of them had a blower duct to keep the negs free of dust. There was often an undersize mask used for each print that chopped off one side to make sure any slight slippage in the feed mechanism didn't result in overlapping frames. They would have been printed from a complete 36 ( or 20/24 ) roll before they were cut into strips to fit in the little packet you collected them in. The bigger machines had many rolls of film spliced together with tape for developing and printing. You sometime see the tape on the end of some of the neg strips. Colour neg film has a large exposure lattitude (certainly compared to slide/reversal stock ) which is how fixed shutter speed cameras with just a sunny and cloudy setting for the aperture ( the famed Olympus Trip for example ) could produce a whole roll of useable postcards. It's a shame that the old-maps.co.uk maps have been scanned at such a poor quality, compared to the NLS maps, because they have a much wider coverage of maps at different dates than NLS. I imagine they have all gone for scrap now. I can't remember the last time one of those envelopes for sending off your films fell out of a magazine. I'm thinking I will scan my black&white negs, but simply scan the prints instead for the colour pics. In any event I've seen the colour prints, my main interest is to see the black&white negs which I developed but never printed. I did very little colour printing, it was just too much hassle compared with taking the film to a photo shop. A couple of shots of the sorry-looking Healey Mills yard at Horbury, West Yorkshire. It closed finally in 2012. Somebody forgot to empty it completely as there are two TEA 100 ton bogie tankers up the other end. P.S. I can confirm the Scalefour Society's FB rail is of the skinny head type having measured it. ....and in case anybody has the wrong end of the stick I didn't walk all the way back from Wakefield. Map? We don't all live in the Frozen North. Never really happy with my attempts to scan colour negatives. However, colour prints were fine. My finally acquiring a decent camera (Yashica Minister III rangefinder) around 1979 coincided with Kodak improving not only their print films but also the processing thereof. Much preferred prints to slides anyway so stuck mainly to them. The pic of An Ruadh Stac above was taken with a Nikon F601 with 35-70 zoom, and Kodak Gold 100. Thought everybody knew where it was and it was far from the frozen north yesterday - I had to take my coat off. Back to digital - Bringsty Common, Herefordshire, 3rd July 2017. Looking across Suckley to the Malvern Hills. It was fine here too on Saturday. For one day only. Bringsty Common... Ah the Live and Let Live. In the 70s a few of us used to nip over there, camp for the night and sample the pub. Great spot! Ilford HP4 developed in Johnsons Unitol. I've obtained an air blast gun which has helped with eliminating dust specks from the negs. Another use for bullhead rail. Upside down, done that a few times An ex-railway bridge that carried traffic from the Wigan and West Leigh Junction branches. Taken on a smartphone, Developed in my pocket on the way back to the car. Rob Manchester wrote: Taken on a smartphone, Developed in my pocket on the way back to the car. Thanks Rob. Something went wrong with the developing because it seems to have areas of fuzzy low-res mixed in with areas of hi-res. Very odd. Yes, you can find old bullhead rail everywhere. Also in this part of the world old bridge rail. Martin Wynne wrote: Rob Manchester wrote: Taken on a smartphone, Developed in my pocket on the way back to the car. Thanks Rob. Must check the lens on the phone and clean off the fingerprints ( or maybe the heat from my leg caused the detail to bleach out in some areas ). It is one of those silly phones where the wake-up button is on the back not far from the lens and flash. A bit ironic because I left the decent phone in the car as it was only a short walk. If I go again I shall take a better shot..
Do you reckon the holes in the end of the rails are original ones for the fishplates ? Counting the bricks gives around 30 foot lengths. This is the view from the nearby farm/foot bridge. There is no sign of the railway on the towpath side of the canal. It is great now we finally have some leaves on the trees after a slow start this year. The holes look correct for fishplates. Almost certainly. You certainly know your Wales, I didn't give the location (although a right-click would have provided a good clue). That's a great shot. Thanks for posting. I know the spot well. When they rebuilt and re-aligned the main road above the railway I was hoping they would leave a bit of the old road as a layby, because that spot has great potential for snaps and it was impossible before. They did! So if I'm heading north up the A487 and have a camera in the car and it's the right sort of day I often stop to see what sort of shot is available. That's a great pic for anyone wanting to colour old brickwork. Yes, those a fish-bolt holes. Very often seen on old rails, and sometimes not so old -- frequently seen in one end of a check rail. The view from Walsgrove Hill last evening. Abberley Clock Tower and Abberley Hall School. I've been wandering the Herefordshire/Shropshire border in the sunshine. Actually not so hi tech -- the Woofferton radio transmitters date from the 1940s. It's the last shortwave transmitter station in the UK, transmitting BBC World Service to Eastern Europe, and also some local radio stations. At one time it was the main European transmitter for Voice Of America. If you ever listened to that, and knew the quiet rural location, it was amusing to hear the callsign "This is the Voice Of America, from Woofferton". Re the Woofferton railway shot. Map from 1903 is here and I am a little confused. Assuming the shot is taken from Station Road looking along where the platforms would have been where is the bridge in the distance that appears to have had it's span removed just leaving the abutments ? It is a nice looking track plan, see here. Wood yard with travelling crane, a wagon turntable in the goods yard and a junction with the Tenbury line. Junctions are not easy to model in the spaces usually available to us. P.S. Just looked at the modern OS map and there appears to be a bridge shown where the abutments are. Google Maps shows it severed. It looks a bit grand to have been just an occupational crossing. A great track plan. Unusually the branch bay platform was on the opposite side of the main line from the branch, so all branch trains had to cross over. In later years they used the main platform. I don't know when the bridge was removed, but I will try to find out. A pic of a 'Flying Banana' too - lovely. My first job in the BBC when I joined in 1972, was to intercept (receive) the VOA SW stateside transmissions, select the best of 2 or 3 frequencies for each language stream using various reception techniques, apply any filtering to improve the signal, insert program announcements, etc before sending them down audio program lines to Woofferton for retransmission. For the special English and Russian programs some music programs were supplied on reel-to-reel tape which would be inserted into the program stream. 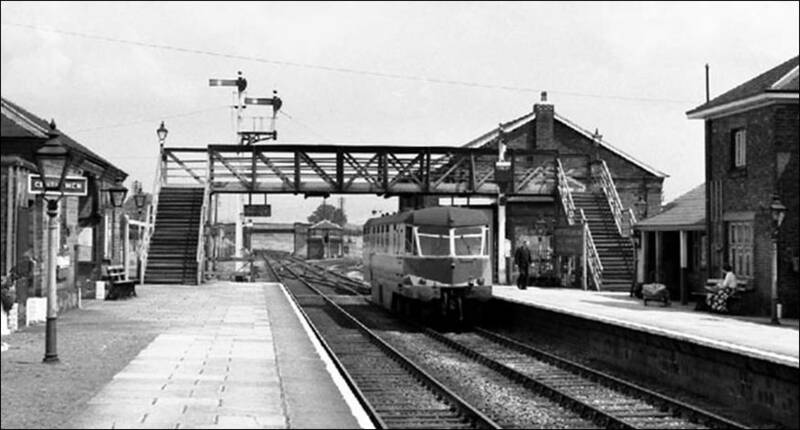 The "Woofferton" part of the station announcement was later changed to "facilities made available by the British Broadcasting Company". We also did the same re-broadcasting for Radio Canada International. Maybe it's no coincidence that the line hereabouts is still using GWR mechanical signalling? Actually, it was only last month. Light conditions were a bit hazy today for distant views. I think I need a polarising filter, although how much difference it will make I'm not sure. You can type a quick reply to this topic here. Click in the box to begin. But to reply to an individual message, or to include images, attachments and formatted text, use the reply buttons on each message above. To start a new topic in this forum, click the Start new topic button below. To start a new topic in a different forum, click the Forum Jump drop-down list below. Templot Companion - User Guide - A-Z Index Templot Explained for beginners Please click: important information for new members and first-time visitors. Please read this important note about copyright: Unless stated otherwise, all the files submitted to this web site are copyright and the property of the respective contributor. You are welcome to use them for your own personal non-commercial purposes, and in your messages on this web site. If you want to publish any of this material elsewhere or use it commercially, you must first obtain the owner's permission to do so. The small print: All material submitted to this web site is the responsibility of the respective contributor. By submitting material to this web site you acknowledge that you accept full responsibility for the material submitted. The owner of this web site is not responsible for any content displayed here other than his own contributions. The owner of this web site may edit, modify or remove any content at any time without giving notice or reason.